Advertising has always been about creativity and addressing the pain points of your consumers, and it still is today. Throughout the years, advertisers have developed guidelines for most industries (including banner advertising), and those guidelines are often regarded as absolute by any advertising professional. Rarely do we question the so-called “best practices” of advertising, and when problems start to come up (not enough conversions, bad CTR, etc. ), people often look for solutions in the wrong places, disregarding what’s right under their nose. Although there are hard-and-fast guidelines that should be followed, ad design is something that simply cannot have a universal standard. It will always be different depending on the industry, and you need to tailor it to your brand and audience. 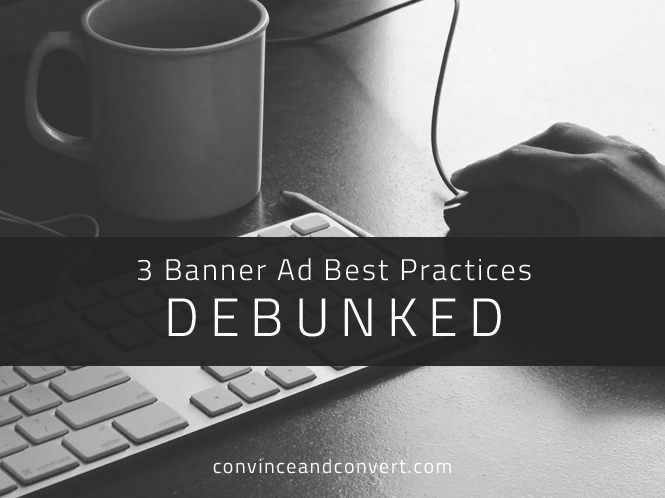 Below are three banner ad best practices that should be avoided in some cases, depending on the industry, brand, and audience. It’s a widely accepted fact that visuals in banner ads increase the overall performance of the ad, compared to ads with no images. While this really is true for consumer-centered brands (where the visual shows people using, wearing, eating, interacting with, or enjoying the product), B2B businesses or service providers might not benefit from visuals as much. In fact, the image might end up doing more harm than good. This all depends on the visual and the context. You need to make sure that your image is truly related to your industry and brand. If you organize wedding ceremonies, photos of brides wearing a wedding dress will surely be great, but if you are a CRM software provider, an image of a person putting together a server might not be the best idea. A personalized, imageless ad representing your brand might be a better fit. In the example above, you can see a banner for a tech company inviting you to subscribe to their newsletter. It’s got a neat design and good coloring. If this banner had a picture of a happy woman in front of a computer, it wouldn’t be as appealing as it is right now. Psychological studies on color reveal how each color sparks something in people’s minds, makes them feel certain emotions, take some kind of action, etc. This is true on some level, but not in 100 percent of cases. Sometimes the color green (which is supposed to increase CTR) just doesn’t work. Rather, you should be more focused on the colors of your brand and logo and associate your ad’s colors with those, especially when you are running a retargeting campaign. Chasing after commonly accepted “actionable” colors when you need your brand to be recognized at first glance isn’t a good idea. McDonald’s utilizes color psychology to great effect in this example. 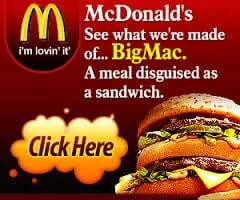 Not only does the ad use on-brand colors, but it also shows a yummy burger on a red background, the color of desire. It’s pretty hard to resist the temptation, don’t you agree? Again, there are plenty of best practices that work, like creating vividly colored ads and choosing a good spot to make them stand out from their surroundings, but the point is not to follow every piece of advice blindly. While CTR (click-through rate) is an important metric to track, it is not always your top priority for every occasion. It all depends on your goals and what you want to achieve with your ads. If your goal is to generate as much website traffic as possible, then CTR is surely your best metric, as it shows precisely what you need. In the case of conversions, however, good CTR doesn’t necessarily correspond to good conversion rate. You might be getting a lot of traffic, but instead of converting, users might just be leaving your website. According to a study done by comScore, clicks have almost zero correlation to conversions. Sometimes consumers don’t click banner ads, but this doesn’t mean that they are not influenced by them. If you want to increase conversions, focus on metrics like brand strength and direct search. The end goal of any ad is to drive sales and generate revenue. If you are getting a ton of clicks but almost no cash, then you are doing something wrong. When thinking about banner design, don’t follow all the guidelines carelessly. Rules are made to be broken, and this is especially true in advertising. If something isn’t working out, running A/B tests is always a solid tactic to understand where things went wrong and what you can do to fix them. Tuan Nguyen is a banner design and advertising expert. He is the founder of 20 Dollar Banners, a banner design company that helps businesses create compelling ads that resonate with their audiences and increase revenues with each passing year.